This group of people could hardly be called a team. They all were working for the same client, a big international organization to which they were providing advanced IT services. Yet they worked from two different sites, some people from Poland, some from Hungary. What’s more, they worked for different parts of the Client organization. Not only for different departments, but also for different departments in different countries – a few people for Germany, a few for the Netherlands, some people for UK. Generally, it seemed that apart from working for the same client they actually had little in common, and that they actually wanted it that way. Some gossips said that there were “some incidents” in the past, and the previous manager had not cared too much about complicating his life with some “communication”. It seemed easier and better this way. However, this way was not necessarily more productive, not necessarily more healthy, and generally not safe business-wise. Due to some reorganizations in client structures, which were coming somewhere from the headquarter, far away from anyone’s area of influence, many operations were transitioned to India. It happened that they were transitioned precisely from those parts of the client organization which were supported by Hungarians. Even if the Hungarian developers were doing a great job, central decisions were unnegotiable. The Hungarians faced a dilemma: should they dismiss 40% of the staff or try to squeeze them into other projects until they have better luck again. Taking into consideration the unique set of skills which they have created, having worked for the client for years, this was a difficult dilemma. The Hungarians knew that if they let developers go, they might be hard to get back. Poland had never heard of problems of that kind. Not only because they had basically no idea what was going on in Hungary. Project managers on the Polish side were facing the challenge of abundance. The parts of the client organization which they were working for, had a need for people, and even more people. Training an even experienced C++ developer in the client specifics was long and could take even a few quarters. These competences were really quite unique. ETTA was approached to help by the Key Account Manager. He had worked in this organization for a few months now and he sensed unexplored areas of synergy. He was also lacking a good overview of the full potential which he would be able to propose to the client at the upcoming business opportunities. Above all, he was lacking sufficient insight into what precisely was happening in Hungary and what resources there might be available. Human resources, or even more precisely: specific skills of specific developers. For sure, if sales of IT services for this client were supposed to grow, the Polish and the Hungarian parts of the team needed to start working hand in hand. The KAM had also some reservations. In fact, he had already made a few attempts to raise cooperation between the two sites. These attempts had failed… It was not clear to him what the problem is about, one thing was clear: there must be some specific reasons why the Polish people and the Hungarians are skeptical about each other. He never succeeded in getting to the root though. – Just don’t you ever tell them there is a problem! – he highlighted immediately after I suggested I would make intake interviews to get a better understanding what was going on. – There is NO PROBLEM. – he said again, stressing that he did want it to be the official version. – The theme of this project is “Bring your team to the next level”. The conversations gave me a lot of insight. – Team, meaning what? – asked everyone, when I cited the project theme. – I mean, what do you mean specifically? – and the Polish people would talk about the team on the Polish side, and the Hungarians would talk about the team on the Hungarian side. Those of you who would be curious what specific questions I asked in the intake interviews, please have a look at a post on How to Prepare for a Facilitated Project. The expectations and needs expressed in these conversations gave a surprising picture: all this bunch of project managers who were supposed to take part in the face to face session, had a very diversified understanding of the current situation, and even the needs around what they imagine could happen. The vast majority did not see any point in any meeting, which required travel and consumed the time, always a scarce resource in their daily activities. – What should take place in the session? I thought you would tell me that! – I heard from most of them when I asked my first questions. Yet almost all expressed the interest to get to know people from the other site, and seemed to look forward to the social part of the meeting. – If we are to meet, it would be nice to know what they actually do in that Poland/Hungary. – KAM was confident: we are looking for areas of increasing communication of cooperation and we are looking for synergies in order to increase sales for the client, serviced from both sites. This is how the rough program came to life. Very rough and very flexible, as this is what facilitation is about – we strive to reach the goal, but the road to the goal might be diversified. What is important is the group energy, most productive time of the meeting, and constant goal orientation. First steps – we get to know each other, the icebreaking activity introduced in order to warm up a group of indifferent people for working together later on in the session. After the first hour the first goal: to get to know each other as people, reached, expectations met, first small success is there. The group seems to be ready for the next step. Exchange of information on what is going on in the sites. How to incite that, if only some people were unanimous about that? I am introducing instructions preparing for the next step, yet the Hungarians, instead of following what I proposed, start asking questions to the Polish project managers right away. – How is it like here? Because we have such a situation. There is this problem. We have such people. Who do you know in the client organization? – this is the best situation for me as a facilitator. They do not need to be extra prepared for the exchange of information, and the topic is so important for them that they don’t want to wait. The Polish participants initially slightly surprised, quickly follow the pace. My role now it to follow what is going on and ensure productivity of the process. The next hour and a half I am an active observer of the flow. Reaching the lunch time, threads start dissolving and multiplying. Now it makes sense for me to step in. This is the right moment to summarize what the group has been doing and what it has achieved so far. In a sense, it is organizing and appreciating the work done until now. It’s also time to plan what comes after lunch. – This is what we talked about (a list of topics). A question unanswered was (I’m citing the question which was still open). Other threads which start to appear, are (this and that). How would you like to use your time after lunch? From your perspective, what will bring the biggest benefit? – Together, we set the list of topics to go through after lunch. For me as a facilitator, this is an important moment. The participants start to understand my role. We start working as partners in creating this meeting. Afternoon is the time of attentive care, to what extent the depth and level of detail of the topics discussed really serve the goal, and what are meaningless or irrelevant meanders. I am also the time keeper, in the sense of the best use of time matching the goals. At the end of the day it becomes clear that both sides have built up mutual interest. The business context combined with relationship, which was strengthened at the beginning of the session, gives space to think in the category of the big Us Together. At the very end of today’s session I am inviting the participants to one of brainstorming techniques, and I push them to be done with it until the end of the working time today. It is important for the ideas to ripen during the evening, so that new ideas can appear further on. May the evening conversations base on what has become possible today. In the morning it turns out that the dinner evolved into a party. Some people are in a poor shape. The day starts with the Key Account Manager presenting development plans and possibilities around the common client. This day is devoted to putting yesterday’s brainstormed ideas in order, categorizing proposed actions, prioritizing them, and finally – to creating action plans. All with the assigned Who and By When, just as the participants have explicitly requested. Today as the facilitator, I steer more, but by now it is clear: I take care of the workflow, and the participants are responsible for good quality contents. Until 1:30 pm the participants are able to group all ideas into four categories of action and create action plans, discussing them with others. Ready to implement action plans, including plans for mutual cooperation and communication, are created with the willingness to make them happen. This is the end of our common time and my work in this project. – Yesterday we met as strangers. Today I am saying and thinking about us: A team! – says one of the Polish project managers. The goal, which the key Account Manager stated just as the desired direction to go to, which perhaps could be met after a longer period of time, which required much work and diplomacy, which he had worked on previously in vain – this goal became a reality. – I have been in many meetings – says Peter, the oldest from the Hungarian team. – This meeting was the best use of time which I could imagine. Thank you! Facilitator makes is easier to reach what the group members decide to strive for. 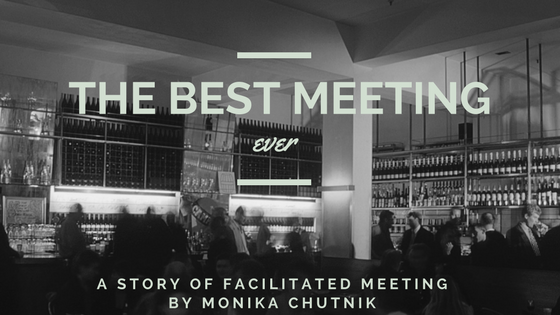 Each meeting is unique, just as its participants, the moment in time, and the topic which they meet about. The key to success is reacting flexibly to what appears, with utmost care about the group as a whole and its individual members, with uncompromising orientation towards the goal. Thank you, too! Organisation Development Consultant, Cross-Cultural Trainer, Facilitator, and Leadership Coach. Expert and Speaker. Entrepreneur and Manager. Founder and Head Consultant of ETTA Global Leadership Consulting. Co-Founder and the first President of SIETAR Polska, Society for Intercultural Education, Training, and Research.